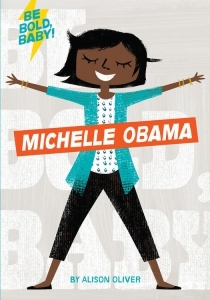 Celebrate Michelle Obama’s most motivational and powerful moments, with quotes from the former First Lady, and vibrant illustrations by Alison Oliver (Moon; BabyLit series.) Be encouraging. Be brilliant. Be you. Each book ends with a mirror! Look for the companion volume, Be Bold, Baby: Oprah.